Explore Swindon’s history through the lives of seven of the town’s most famous animal inhabitants. From Mr Heginbotham’s snails and Eastcott’s cricket infestation, discover the stories of Swindon’s famous animals for yourself. There will be a special focus on Bruce the Collecting Dog, the canine hero who raised thousands of pounds for local orphans, the Victoria Hospital and survivors of the Titanic disaster. Bruce wore a special collecting box on his back and barked a thank you for any coins he was given. 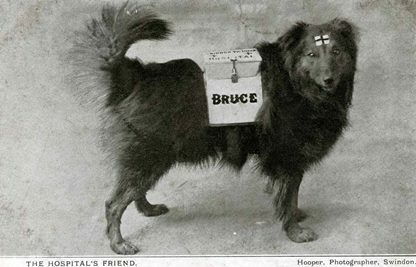 You can see Bruce’s collecting box, as well as photos of Swindon’s hero dog. This exhibition features photographs, paintings and objects from Swindon’s collections, including examples from our extensive natural history collection. There will be activities for younger visitors, too!